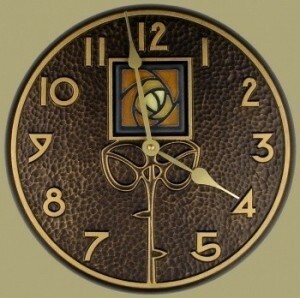 One of our BEST SELLING GIFTS: The Dard Hunter Clock with a 4" Rose Tile. This unique clock in cast aluminum features the number style designed by Dard Hunter, with an inset rose tile by Motawi Tiles completing the rose and stem motif. Antique French bronze finish. The clock is 12" in diameter, with quartz movement. Requires 1 AA battery. Choose Dark Oak (pictured 1st) or Green (pictured 2nd).